School Sensor Can Alert Authorities, Lock Doors When Gunfire Is Heard The bullet sound detection system is being developed by a missile engineer and is being tested at an elementary school in New Mexico. Jim Skorpik developed a gunshot detector for schools at Pacific Northwest National Laboratory in Richland, Washington. At work, Jim Skorpik's nickname is a handle better known for missiles: "Hellfire." As a longtime federal electrical engineer at the Pacific Northwest National Laboratory in Richland, Wash., he's developed sensors to track missiles' readiness for battle that measure heat or impacts that could damage them. Lately, Skorpik has turned his know-how to schools. He's designed a system to identify a gunshot's location and caliber. When it's integrated with a security system it can alert authorities, train cameras on the area where shots were fired, lock doors, sound the building's public address system and lock perimeter doors. It started for him with the Sandy Hook shooting. Then a couple years later three of his grandchildren had a real-life lockdown of their own. "The youngest one, she was like in kindergarten, and she came home pretty emotional," Skorpik says. "She was in the gym and the teacher was covering the kids with gym mats." After that he applied for money to develop a sensor for schools to detect and locate gunfire within the building. EAGL Technology of Albuquerque has licensed the technology and it's been installed and tested at Hermosa Elementary School in Artesia, N.M. The gunshot detectors are each a little bigger than a pack of gum. Scott Simer, the facilities manager for the Artesia school district, points out one system — a detector and then its main frame, "the brains of it," down the hallway. 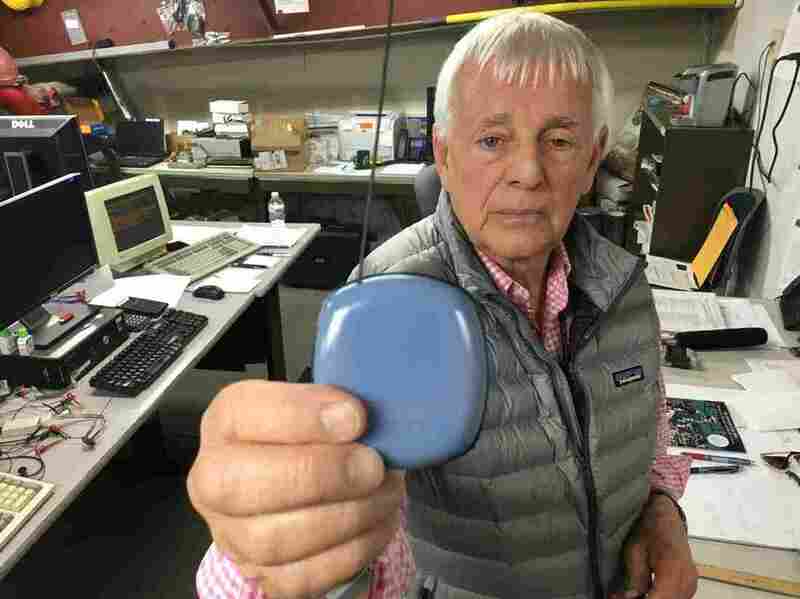 Simer says the wireless, battery powered sensors can distinguish gunfire from other loud, percussive sounds: a textbook dropping, a ruler slapping a desk or even a firecracker. "It's sad that we're in a society where we have to have stuff like this," Simer says. "And that we are testing stuff like this in a school. But the reality is, it happens." "We set off some M-80 firecrackers in the school," he says. "It didn't pick 'em up." When police shot real guns at the school during off hours the alarms went off and the doors locked like they were expected to. "It's automatic," Russell says. "You don't have to have a school resource officer or a principal or a superintendent or a teacher or any kind of administrator activate the system." She's heard concerns that the automatic locking of doors could leave someone vulnerable in a hallway. The idea is to get as many people behind locked doors as fast as possible — like teachers and students practice in drills, and do in real lockdowns. "The people in the building can worry more about getting the kids to safety and not having to call 911 when they are sitting under a desk trying to hide from the shooter," Russell says. It's not the first, or only, gunfire locator system. Most are developed for outdoor use by police departments. Tabatha Moreau, president of Hermosa Elementary's Parent Teacher Organization, says she's glad the school district has become an early adopter of this type of technology. "As a parent, you want your school district to do everything they can to help protect our children," she says. She's glad the sensors are small enough that the students likely aren't aware of them. "It's not something that the kids see and notice and freak out," Moreau says. "I think they need to know the risks, but I don't want them fretting about it all the time." Artesia Public Schools plans to put in the detector systems in six more of its schools before classes start in the fall of 2018. Russell says EAGL has seen an increase in inquiries since the Parkland shooting in February.